The narrator informs the reader that he is in all likelihood, the last survivor of his family and that no one could have survived the fire. He then goes on to explain what happened. He first introduces an experience of wandering the countryside and coming upon four horses lying upon the ground, apparently dead. Yet, their presumable owner still seeks to fill their trough and the narrator is baffled by this action wondering if the man cannot see if they are dead, chooses to ignore that they are dead, or knows something about their state of living (or unliving) that the narrator does not. From here, the narrator provides the briefest of backgrounds about growing up, getting educated, starting a family and eventually falling out of love with his wife until an accident at work breaks his skull and sets him down a path of confusion. From here, the question of sanity rises again and again as he insists on noticing a variety of odd things about the house they live in. Things are moves and changes just slightly from day to day and he seems to be the only one to know it. More frustratingly, he can't seem to know whether he has three children or four. Some days, it's three and others, it's four. He must try different tactics to determine how many. Of course, all of these changes cause him to act stranger and stranger, so his family alienates him more and more. He takes to going for long walks, believing that the house may be the evil behind all of this but it's during these long walks that he encounters the four horses. This scene proves so stressful that he begins to stop going for long walks for fear that he will see it again. He ruminates how the fear in his life is dominated by house and horse (a 1-letter difference between the two). Eventually, he decides he needs to face the horses but can never seem to find them again, which leads him to burn the house down. In the end, he tries to explain that he knows this is exactly what happened and that the person who he is talking to should stop claiming to be his wife, he knows she is dead. Overall, I liked how one had to question every part of this story. All the substantive parts are up for question. Did he ever come across the horses? Did he ever have a family? Did he kill his family? Is he now in a prison or asylum? It's all up for grabs. Beyond this, the dreamlike sequences that Evenson designs to feel like we, are phasing in and out of consciousness with this tale is also quite enjoyable. But I also like the profound existential angst by the narrator, witnessing four horses possibly dead and a man still filling the trough to be such an intriguing and halting image. The futility and the curiosity of the situation mingle together and Evenson makes a strong case about how it could profoundly alter one's sanity to a degree. I had found the story recommended a few times in different places and am glad I took the time to read it. It makes me think I will be reading more by Evenson in the future. 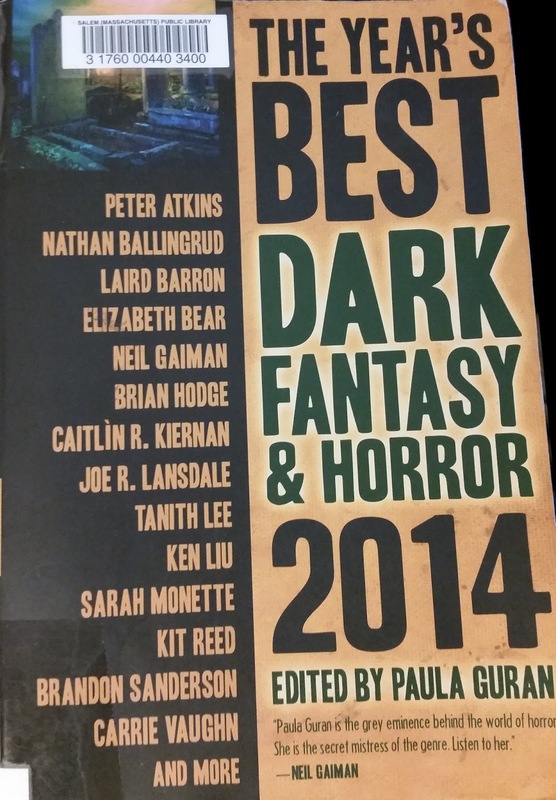 Source: The Year's Best Dark Fantasy and Horror, 2014 edited by Paula Guran. 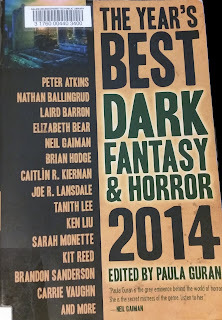 However, you can also find the story offered here at The American Reader.